The first records of fly fishing in Victoria date from the 1850s, when English fly patterns were sometimes used to catch small species such as Australian grayling and ‘native trout’ (galaxias). A newspaper letter in 1871 described boat based saltwater fly fishing for ‘salmon trout’ (young Australian salmon) on the Hopkins River in western Victoria. Another newspaper letter in early 1873 announced the discovery that ‘Gippsland perch’ (Australian bass and estuary perch) in coastal rivers could be caught on large colourful artificial flies. Trout were introduced in the late 1860s, and were caught on flies from late 1873, but fly fishing grew only very slowly until the early 20th century. The first fly fishers’ club formed in 1906, and the sport became more popular through the 1920s and 1930s. Part of the growing interest was due to the construction of dams at Eildon, Albury and Glenmaggie, where fish thrived on the rich food supply as water flooded new ground. This pattern was repeated in the 1960s and 1970s with the creation of new dams in the Snowy Mountains of southern NSW, the availability of cheaper tackle, and widespread car ownership. Today’s Victorian fly fishing remains focused mainly on trout, from the rich lakes of the western district through to the mountain streams of the north-east. Estuary perch, bass and Australian ‘salmon’ (kahawai) are also pursued. 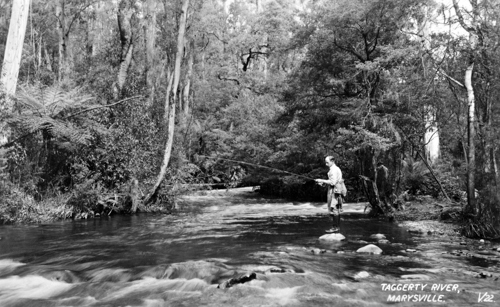 Victorian anglers have long been regular visitors to Tasmania during the hot mainland summer, and some have made important contributions to Tasmanian techniques.